It’s 1886. Britain and France have been at war for more than a decade over Voltite – the most powerful energy source that the world has ever seen. With invasions to both countries ending in a stalemate, inventors soon turned their attention to creating seven-meter tall mechanised war machines called Ironcast, powered by the very same energy source that they were fighting over. That’s where you come in. In this alternate take on 19th-century history, you are recruited as an Ironcast commander charged with laying waste to enemies of the British Empire as the country falls under attack from invading forces. That will soon see you sent on missions across South East England, seeing you stomp your Ironcast to towns, cities, and boroughs such as Tunbridge Wells, Croydon, or Canterbury. 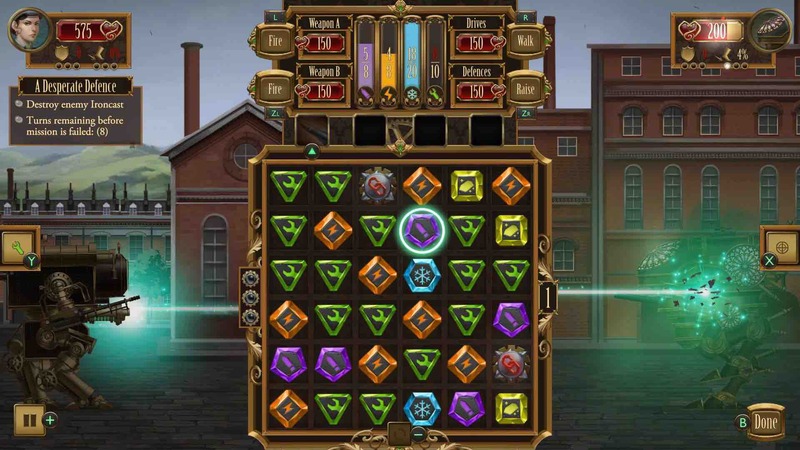 Ironcast can be easily recognised as a steampunk turn-based strategy game but, in execution, it soon builds into a remarkable experience that is hard to put down. That’s partly thanks to the variety in mission design, that not only sees players challenged with taking down a lumbering enemy Ironcast, but surviving against enemies for a specified number of turns, trading supplies with other characters, or retrieving prototype power cores from French spies. Whatever the circumstances, these encounters see your Ironcast come face-to-face with another mechanical monstrosity, with the ensuing battle playing out in relation to a grid filled with coloured nodes. These relate to ammo, energy, coolant, and repair, and, whenever three or more nodes of a particular type are matches, it generates resources that power your Ironcast weapons and systems. 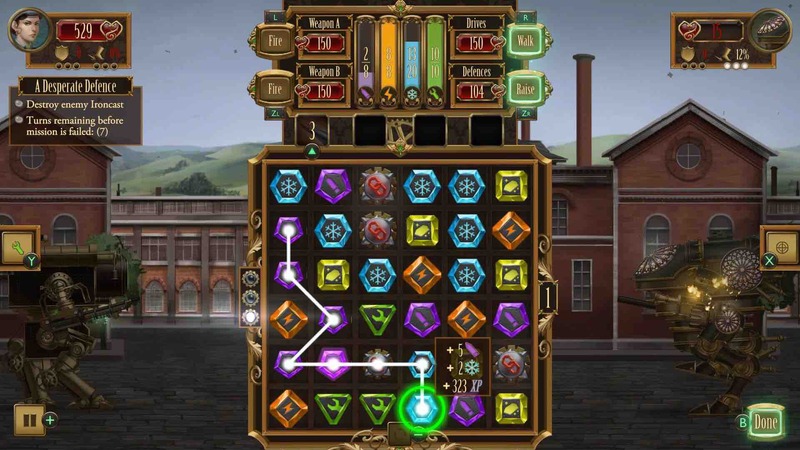 You are only allowed two chances at generating resources each turn, meaning that, unless no other options are open to you, players will need to ponder whether to load their weapons to obliterate the enemy Ironcast, power up their shields to dampen enemy attacks, restore coolant to make sure that their Ironcast doesn’t overheat, or repair any damaged systems. That leads me on to the clever mechanic that developer Dreadbit soon introduces, where players can specifically target their attacks at the weapons, mobility, or shield systems on an enemy war machine. This tactical play can see you temporarily reduce the threat from an overpowering enemy by taking out a potent weapon, or knock out their shields so that you can puncture their hull with a machine gun. It’s smart, and, collectively, makes you consider your approach in battle instances, rather than mindlessly matching nodes. Success can reward you with War Assets, Scrap, XP, Equipment, and Blueprints, which come into play when you return to the hangar bay between missions. It is important to use Scrap to repair your Ironcast ready for the next mission, but, alongside that, it can be used in the Workshop to build new weapons, shields, and evasion systems based on the Blueprints that you have looted. Scrap can also be used to upgrade your hull armour to increase your maximum health, or on the ammo chamber, energy capacitor, coolant tank, or repair tank, in order to let you store more resources gathered from nodes in combat. This extensive modification not only means that any two campaigns are hardly ever alike, but makes the experience more personal as you enhance your Ironcast however you wish to better deal with the enemies that oppose you. Levelling up similarly presents its own powerful rewards, opening an opportunity to choose between a new Passive Augmentation or Ironcast Ability. There are three randomised skills to select from once you hit a new Commander Rank, with examples seeing a particular node’s spawn chances increase, immediately repairing damage that your Ironcast has taken, reduce your opponent’s evasion temporarily, or to fire a bonus round with the next weapon that you use. With roguelite elements, it’s worth mentioning that missions can be failed if you run out of turns or mess up an objective, but, it is only if your Ironcast is destroyed that your retaliatory campaign is cut short. That whisks you back to the main menu, where your only choice is to start over and rejoin the fight – a single playthrough challenging you to prevent a French spearhead from reaching London within 10 turns. When you first start fighting for Queen and country, players will only have access to welsh commander Aeres Powell and The Dunraven, one of the earliest Ironcast models that, while named after Dunraven Castle in South Wales, was designed and built in Scotland. These forced choices are fairly balanced to adopt any particular role in a battle, although, expectedly, not as well in any specific role as a more specialised Ironcast. 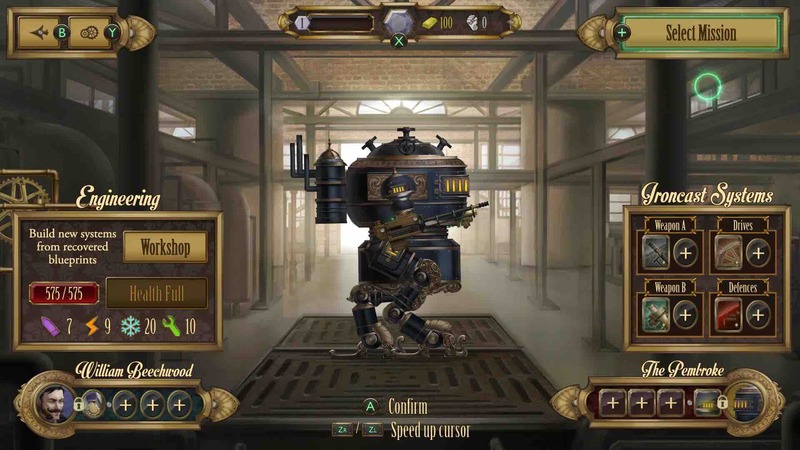 The intention is that successive playthroughs will steadily reward you with Commendation Marks that can be redeemed in the Commendation Exchange, meaning that even a short-lived run can result in the chance for the player to unlock new commanders, Ironcast, abilities, augmentations, and boosters to strengthen their war effort. That may raise fears about unnecessary grinding, but worry not, Dreadbit has struck this with the right approach. Ironcast basks in a steampunk style, but more differentiation would have been welcomed from a visual perspective. There has been a focused effort on creating the menacing Ironcast, but, especially for a game that so readily engrosses you into repeat plays, that, and a seemingly limited soundtrack, are too minor gripes that could be addressed if a sequel ever came to light. And minor they are, too, seeing as Dreadbit knocks their Nintendo Switch port out of the park. HD Rumble support feels incredible – rippling from one Joy-Con to another in response to an Ironcast unleashing an energised shot – while the touch screen functionality works without any problems to report – for those that would rather not use traditional button input. I found myself playing in Handheld Mode more often than not, but, there certainly aren’t any issues to worry about when docked. That all leads to a particularly positive impression for Ironcast, which easily becomes one of the strongest showings on the Nintendo eShop that I have played in the six months since Nintendo Switch launched. As engrossingly deep as it is engaging, I can only hope that you join us in our fight to defend Victorian England. We need you, commander.